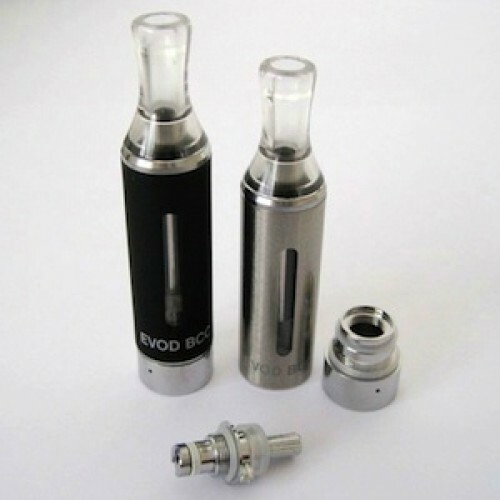 The EVOD clearomizer has an eGo style fitting with a replaceable bottom coil, transparent tank covered by a metal protective cover. These clearomizers hold around 1.6ml of liquid. Please be aware that with this design, the top mouthpiece does not come off. To fill, unscrew the base from the tank, turn the tank upside down and pour liquid down the sides of the tube. Screw the bottom element back on whilst the unit is still upside down and then the unit is ready to be used. 510 threaded, suitable for use on devices with a 510 thread like the eGo battery.